You won’t find Larry’s life history in any newspaper article or government archives. You won’t find his name engraved on the massive, highly polished, black granite Vietnam Memorial Wall in Washington, D.C. even though he was a tragic, and very real, casualty of the Vietnam War. Trying to fit Larry’s life story—or that of any in-country Vietnam veteran—into a few short pages honestly does not, and cannot, do justice to their lives or their struggles. Nonetheless, the accounts of their lives need to be told. Their stories need to be told over and over again so that we don’t forget why and how Larry and countless other veterans suffered and died because of their service to the United States in Vietnam. Nor should we forget how they were treated by administration bureaucrats after the war. You won’t find Larry’s life history in any newspaper article or government archives. You won’t see his name engraved on the massive, highly polished black granite Vietnam Memorial Wall in Washington, DC, even though he and thousands of other veterans were tragic but very real casualties of that War. During all the years I knew Larry, we never talked much about our experiences during the war. Still, every now and then, a circumstance or particular word would come up in our conversations with family and friends that would trigger our memories, and we’d start talking to each other in terms and words that only we could possibly understand. On more than one occasion, we garnered some strange looks and had to explain ourselves and our cryptic comments about “the Nam” to our friends or families. Larry and I had been in South Vietnam during roughly the same time frame, but we had never actually met until my daughter, Dena, and his son, Corey, started dating. Still, just the mere fact that we’d been in the country at about the same time predetermined our common bond. We shared not only a lifetime membership in the “Agent Orange Club of Uncle Sam” but also the Tet Offensive2 of 1968. We shared many of the same life-altering and life-affirming experiences that service in South Vietnam offered. We had choked and coughed on the same smoke from burning dung and trash as well as on the dust, sand, and dirt kicked up into the air by the war and the movement of vehicles and men. We had been drenched by the same unsympathetic monsoon rains and had met up with many of the same inhospitable insects, snakes, and other unfriendly critters that called Vietnam home. While we shared many of the same experiences Vietnam had to offer, I still consider myself to be one of the more fortunate veterans. So even though I have had a multitude of health problems over the years, and been in bad shape on more than a few occasions, I’m still kicking, although not quite as high as I use too. Even after having a few life threating surgeries where the doctors removed and re-arranged a few important body parts, I’m still alive and above ground. Yeah, I'm one of the lucky ones—so far, anyway. But there are literally tens of thousands who served in Vietnam—like Larry—who haven’t been so fortunate. Lawrence C. White was just an ordinary, fun-loving guy who enjoyed life and a really good party. Back in 1966, he was just another rambunctious 18-year-old kid who was fresh out of high school—full of promise and dreams—with his whole life still ahead of him. Larry wanted more out of life than just a job. He wanted to go to college and do something with his life. But as circumstances would dictate, he just happened to be born at the right time (or the wrong time, depending on your point of view) to be drafted by the Selective Service System for the continually broadening Vietnam War. Larry tried everything short of leaving the country and going to Canada to get out of the draft; after all, it wouldn’t have been a great hardship to run off to Canada. At worst, it would only have been a minor inconvenience. In any event, all his heroic efforts were for naught. Uncle Sam still wanted him for the war—even with all his feigned illnesses and contrived problems. So despite all his protesting and fighting against being drafted, he chose, in the end, to serve his country, and he accepted being drafted. He didn’t seek a college deferment or rush off to get married and have children. He didn’t slink away or buy a bus ticket to Canada and seek sanctuary there, as so many others had done. He served his country, albeit reluctantly. The area around the base where Larry was ultimately stationed, like most of South Vietnam, was a lush tropical jungle—a heavily canopied sanctuary from which Viet Cong insurgents would attack, only to retreat afterward and disappear back into the thick vegetation as quickly as they’d appeared. Unknown to Larry, to myself, and to the hundreds of thousands of other military personnel was the fact that our future health and fates were being ever so carefully crafted and strategically planned by our government and its military establishment. We were being purposefully placed in the path of our government’s and military’s classified covert pesticide spraying programs. These deliberate but untried strategies would, in time, become known by militaristic codes names, such as “Operation Hades,” “Project Pink Rose,” “Operation Ranch Hand,” “Operation Trail Dust,” and “Operation Fly Swatter.” However, no matter what the operational name was, it would be the aerial spraying of Agent Orange, Agent White, DDT, malathion, and a host of other color-coded, nightmarish, “sunset” herbicides and insecticides that would be problematic and life-altering for most, if not all, of the military personnel stationed in Vietnam. The ever-expanding airborne dispersal of so many harmful tactical pesticides would create a real-life quagmire of illnesses and health problems for the people exposed to them. Ultimately, it would be our exposures to these organic chemicals that would produce the invisible cellular and genetic trauma which would unknowingly come home with us from Vietnam and relentlessly pursue us for the rest of our lives. We all expected to be in danger from the enemy in Vietnam, but never in our wildest imaginings did we conceive of being placed in harm’s way by our own military’s atomized spraying of tens of millions of gallons of extremely harmful herbicides and insecticides. These profoundly dangerous pesticides and chemicals would, over time, turn out to be some of the most prolific killers and cripplers of the Vietnam War—destructive adversaries far more malevolent than the enemy we were fighting. 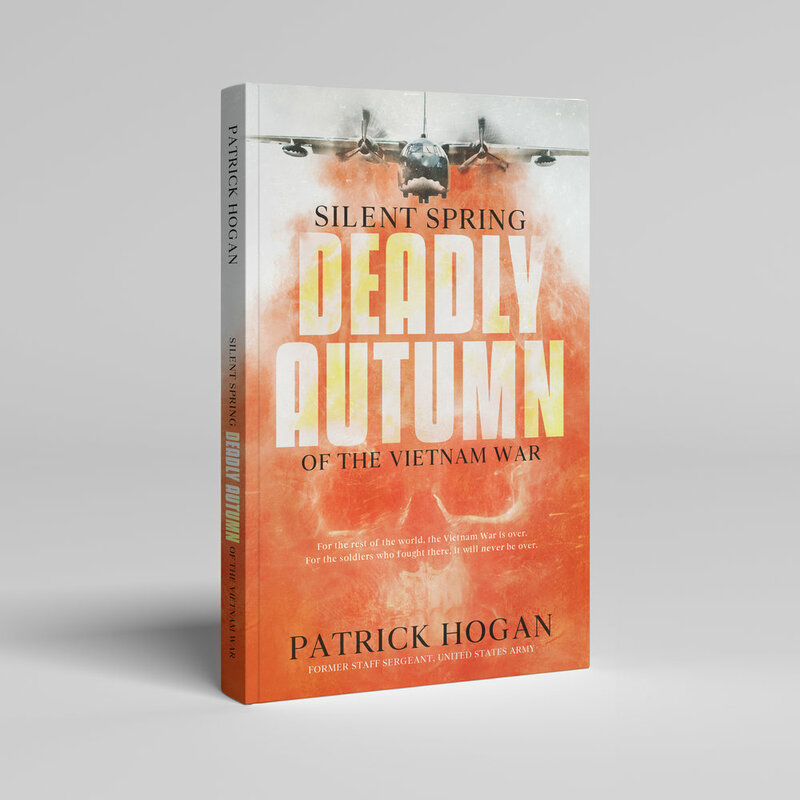 The strategies developed and implemented by the United States to destroy insects, and millions of acres of South Vietnam’s vast jungles have left an appalling legacy for the personnel who served there, whether or not the government is willing to admit it. All the same, Larry and I were, but two of the roughly three million service personnel deployed to South Vietnam who were sprayed with those harmful agents, which means there are still a lot of untold stories about the Vietnam War and its chemical aftermath that need to be told. Larry served his mandatory tour of duty in South Vietnam, and after he returned home, like many of us, all he wanted to do was leave the miserable war behind and get on with his life. But inevitably, the war and its pesticides followed him home. They waited silently, hidden inside his body until they were ready to pounce and attack. They hung around patiently, advancing little by little and ever so slowly, for almost a decade before they sprang into action. They finally ambushed Larry for the first time when he was 29 years old, just as his fledgling life was getting back to normal; he had a devastating heart attack—the first of many. This first heart attack—diagnosed as ischemic heart disease—hit Larry pretty hard and almost killed him. Thanks to God, a lot of praying, and the skill of his medical team, he didn’t die, although at the time, his doctor did think he might. All the same, Larry was left weak, traumatized, and unable to perform even the simplest of tasks without assistance. He was utterly unable to exert himself, let alone work. It took Larry a long time to bounce back from that first disastrous attack. Eventually, over time, he did recover, but his heart was ruthlessly damaged. So since Larry was completely unable to work, his wife Lois had to rejoin the workforce to make ends meet. Larry spent his whole shortened life in and out of hospitals and doctors’ offices. He struggled for his very existence while having to fight with the DVA for assistance. He lived the rest of his abbreviated life hand-to-mouth on what little help his family could provide. Eventually, he was aided by social security disability and state-sponsored social support programs. Essentially, welfare and food stamps became his family’s means of subsistence. Larry labored for decades to get help from the DVA. He filed several disability claims and had many compensation and pension exams with the organization, ascertaining all the while that his ischemic heart disease was a service-connected issue and a result of his tour in Vietnam and Agent Orange exposure. However, his statements and claims fell on deaf ears. No one at the DVA wanted to listen because his illness was not presumed. All his disability claims were repeatedly denied by the DVA because, in their opinion, there was “insufficient evidence” that his condition was service-related. According to the government, there was just no substantiation that his ischemic heart disease was the result of his exposure to Agent Orange and his service in Vietnam. He was repeatedly told that none of the pesticides the government had used there could possibly have been the problem or the cause of his heart disease. The DVA officials told him it was more likely that his genetic makeup, and not his service in South Vietnam, was responsible for his medical problems. As the years ticked by, Larry had several more major heart attacks and other health problems. In fact, his heart was so mercilessly damaged that eventually, it was pumping at a very feeble volume. His actual heart ejection factor was lower than 35%. Ultimately, he had to have a defibrillator-pacemaker implanted in his chest to keep him alive. In the end, it wasn’t his damage heart that finally took his life. It was leukemia. Appallingly, from the age of 29 until his final battles with heart disease and leukemia on December 26, 2009, at the age of 62, Larry never once received any assistance from the Department of Veterans Affairs. Disgracefully, it wasn’t until October 30, 2010, that the DVA began re-adjudicating his claims—almost a year after his death. Ultimately, our government and the DVA were forced to concede that his ischemic heart condition and subsequent leukemia were related to his service in Vietnam and caused by the pesticides to which he was exposed. Nevertheless, this capitulation came way too late. Larry had lived his whole life in almost abject poverty and was barely able to make ends meet, with absolutely no assistance from the DVA. Now I ask you, is that anyway for our government to treat those they claim—at least in magnificent speeches—to be war heroes? Actions really do speak louder than words. The actions of our government officials and DVA speak volumes to me—even though they are mostly adversarial in nature. Larry’s story is only one account. Countless very similar and even more heart-wrenching life stories are out there and need to be told and listened to—stories of soldiers, marines, and sailors who can all relate and trace their illnesses, disorders, and health problems back to their service to the United States. Larry served his required two years in the army with honor and dignity. One of those two years he spent in the hot, steamy jungles of South Vietnam. Consequently, Larry became just one of the countless in-country veterans whose fate had been sealed in Vietnam. He was but one soldier who was injured and eventually “killed by” the Vietnam War, even though he died in Denver, Pennsylvania, some forty years after he had left Vietnam. Rest in peace, my old friend. While death may be the last chapter in our lives it’s only the first chapter in our eternity.